Today we have another dual socket Intel Xeon Scalable workstation motherboard in the lab, this time the Supermicro X11DAC. For those professionals that need the power and RAM capacity of a dual socket platform, this is an excellent platform. The Supermicro X11DAC has a different expansion configuration than the Supermicro X11DAi-N we reviewed previously. The X11DAC also offers SAS3 connectivity for enhanced storage. Like the X11DAi-N, the X11DAC offers setup flexibility with its built-in IPMI and iKVM which we see on many Supermicro motherboards. Let us take a look at what the platform has to offer. The keys here are that this platform offers a high level of storage connectivity with dual LGA3647 sockets all in a standard E-ATX form factor. As an E-ATX motherboard, the Supermicro X11DAC will fit into a number of industry-standard cases. Since this is a workstation product, with many server features, it has the versatility to fit into a number of standard cases. Options include standard tower or rackmount variants making this a flexible platform for high-end users, even if it is not going to sit desk-side. The X11DAC appears to be very similar to other dual processor boards from Supermicro, the main difference we spot is the heat sink for the LSI SAS 3008 controller below the C621 chipset heatsink. A pair of SFF-8643 mini-SAS connectors installed at the edge of the front of the motherboard proved easy access when cabling up your system. Eight additional SATA ports line the left side for other storage devices. That means a total of 16 drives can be directly attached to this motherboard. For the PCIe expansion, there are a total of six slots. Three are PCIe x16 physical slots and three are PCIe x8. 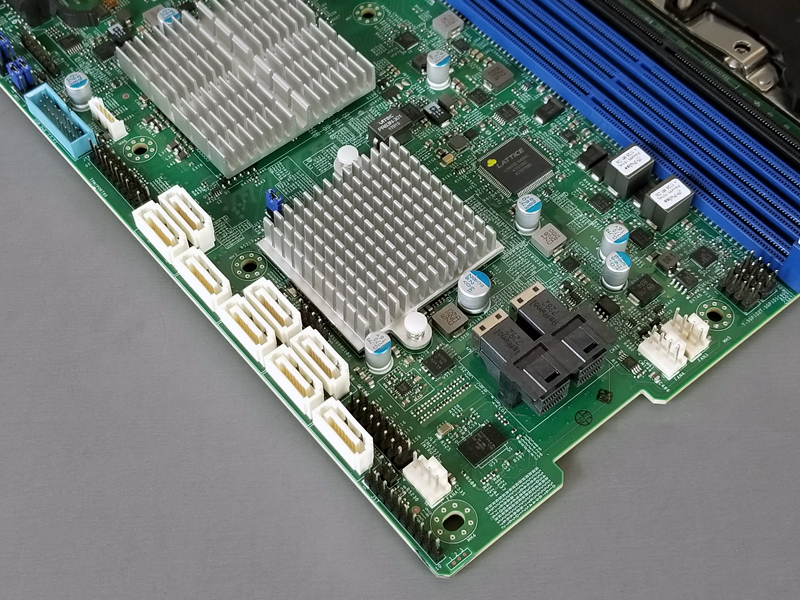 Unlike some competitive offerings we have seen, Supermicro keeps the rear of the x16 slots relatively clear which means most longer GPUs should fit. The spacing of the x16 slots also facilitates using double width cards like GPUs. With only one CPU installed a PCIe expansion card should be in Slot 1 or Slot 2 which are closer to the motherboard edge. Like other modern platforms, both CPU sockets need to be populated to enable all PCIe connectivity. 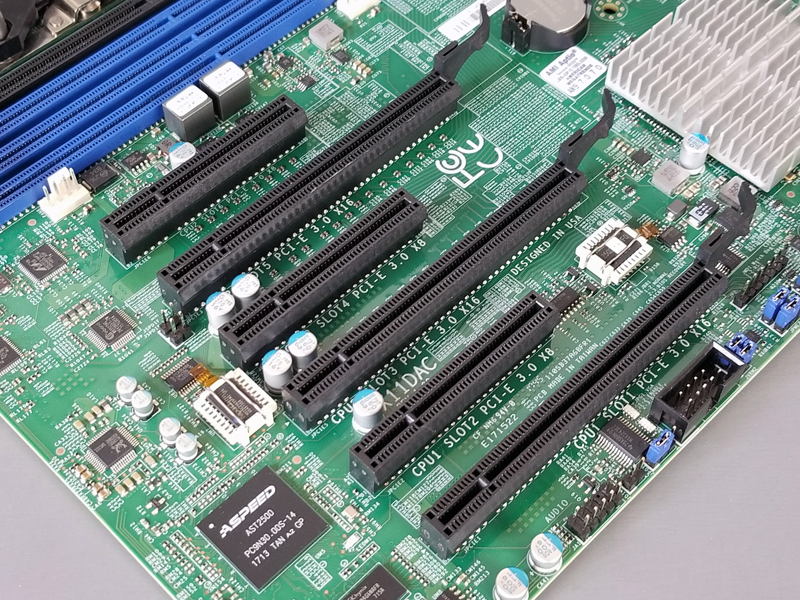 Moving to the rear of the motherboard, we find more I/O than we typically see on server platforms to customize the platform for the workstation market. Consumer-level platforms often come with a much larger array of USB(-C) ports and similar features. This I/O is a cross between what we would see in a server platform but adds features like more USB 3.0 ports and audio connectivity which makes this a platform just as suitable to sit desk-side. Next, we are going to look at the BIOS and remote management. We are then going to look at the block diagram. Finally we are going to share performance results and give our final impressions. This is indeed very nice board, but I can’t resist to feel just a pity that it’s not that competitive at least not in comparison with AMD/Supermicro offerings. Or am I missing something? All your EPYC reviews just crushes Intel these days so why would anybody sane to buy Xeon-SP for the workstation? 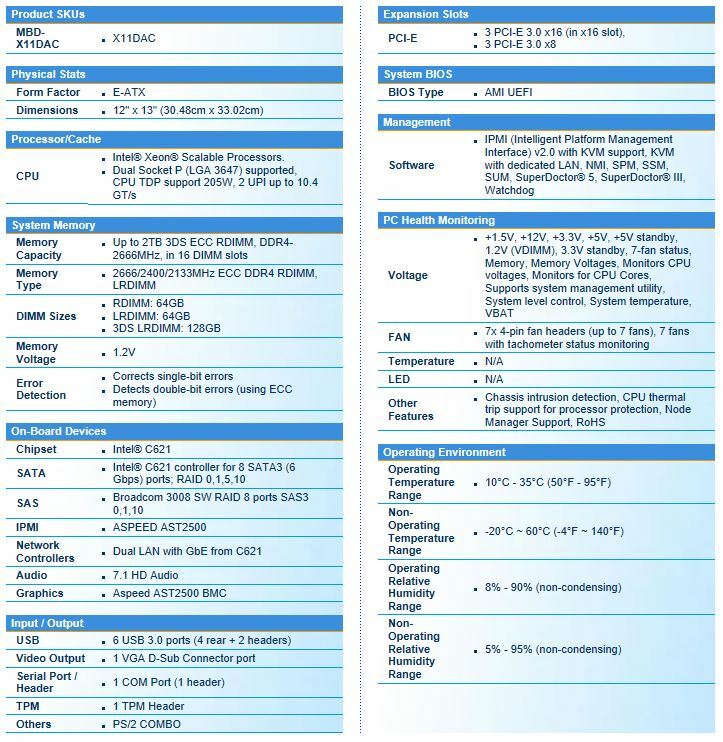 What’s even more pity IMHO is that Supermicro has not used their precious resources to do proper Threadripper2 board to compete with Xeon-W or even simple workstation class board with AM4+ for Ryzen to compete with Xeon E.
SuperMicro is pretty bad in making proper EPYC boards and since they have the same socket as TR it wouldn’t be my first choice. From what I know at the moment is that ASUS, Asrock(Rack) and gigabyte are pretty good with both EPYC and TR. P.s. with SuperMicro EPYC MB’s the connections from the motherboard and the SoC have a lot of connection problems. @Misha: Asrock(Rack) does not provide any EPYC nor TR board. Asrock (non-rack) provides TR boards, but they are all like flashing gamers boards with silly coolers like well from any other gaming board. Gigabyte provides one EPYC board and flashy gaming TR. Asus provides none EPYC none TR board (in server/workstation section). Supermicro provides at least 1 single EPYC and 1 dual EPYC board with several variations in storage. The reason people want Xeon instead of TR is easy, more memory. Instead of EPYC is easy, 1-2 NUMA instead of 4-8. Since I off load most hardware functions from the integrated PCH on the motherboard (RAID, LAN, USB…), would like to see testing that measures the performance of the M.2 connection functioning as a x4 PCIe electrical lane slot, along with throughput values for each of the x16 PCIe electrical slots to compare native x16 electrical lanes with switched x16 electrical lanes. Expensive as the Intel based CPUs and motherboards are, I still have a preference for single and dual configuration motherboards for workstation applications that support Intel CPUs since I can get Intel based motherboards with (4) double spaced x16 PCIe electrical lane slots, with a X16 PCIe electrical lane slot in the bottom peripheral position (furthest from hot CPU and RAM memory) along with up to (8) simultaneously active x8 PCIe electrical lane slots or (4) double spaced x16 PCIe electrical lane slots along with (2) x8 PCIe electrical lane slots and (1) x4 PCIe electrical lane slot on a single, dual CPU motherboard (e.g. Supermicro X11DAC Workstation Motherboard), off loading most every hardware resource and currently not the case with any OTC, AMD supported motherboard. All of the single CPU TR and EPYC boards, even though they have 64 PCIe lanes for each CPU, having less hardware capacity for off loading resources with just (2) x16 PCIe electrical lane slots and just a x8 PCIe electrical lane slot in the bottom peripheral position or just (3) x16 PCIe electrical lane slots on a dual CPU EPYC motherboard with a couple x8 PCIe electrical lane slots to accompany the few x16 PCIe electrical lane slots. EPYC hast 128 PCIe slots on a single socket. The AsrockRack board has 4 x 16PCIe electrical and 3 x 8PCIe electrical. Perfectly for off loading most hardware functions from the integrated PCH I would say. @KarelG: page S-38 of the 2018 catalog from AsrockRack. EPYC is low on clock, but now it is cracked, just wait a week or two and the guides will be all over the internet. 6+1 VRM’s so a 3.5..7 GHz below 300 Watt’s should be no problem, with a bit higher voltage on the RAM you can get CL16 (instead of CL19) with DDR4-2666. Have a look at Der8auer on youtube what you can expect. Does one of the LAN ports double as IPMI port? My post is confusing for I made an error, the Supermicro board I am reference is X11DPX-T, not X11DAC. 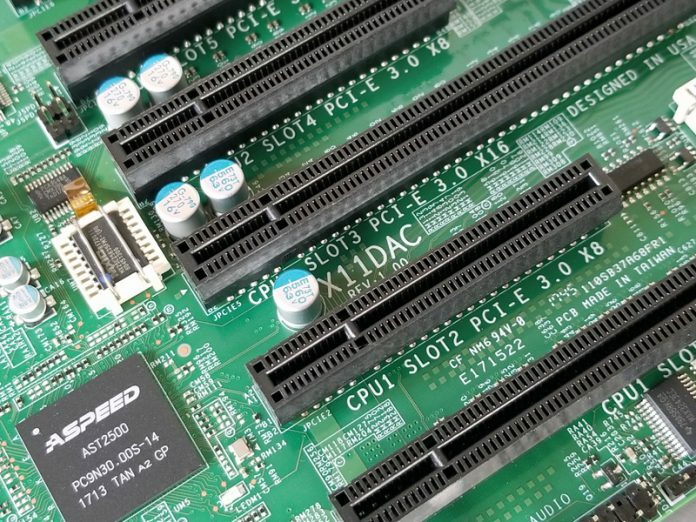 The Supermicro X11DPX-T motherboard will permit for the installation of (4) double spaced x16 PCIe electrical lane slots, with a X16 PCIe electrical lane slot in the bottom x16 peripheral position (furthest from hot CPU and RAM memory) [ALONG WITH] (2) x8 PCIe electrical lane slots and (1) x4 PCIe electrical lane slot on a single, dual CPU motherboard, or up to (10) simultaneously active x8 PCIe electrical lane slots. Thus for a double CPU Intel application that is fully populated, can configure (4) double width x16 PCIe lane cards [PLUS] (2) single width x8 PCIe lane cards and (1) single width x4 PCIe lane card all in simultaneous use for a total of 78 PCIe lanes (multiplexed) for a total physical requirement of (11) case peripheral slots. The single CPU Asrock board is not sufficient since it will only permit (4) double spaced x16 PCIe electrical lane slots or up to (7) simultaneously active x8 PCIe electrical lane slots and no more, for the (3) x8 PCIe electrical lane slots are not mechanically available when a double space peripheral card is installed in the x16 PCIe slot. The Asrock permits a max of 64 PCIe lanes (multiplexed) for a total physical requirement of (7) peripheral slots or (8) peripheral slots if a double width board is installed in the bottom x16 PCIe slot. The EPYC uses 64 of the 128 PCIe lanes to communicate to the other CPUs and not available as PCIe slots. My workstation (custom, double width Caselabs STH10 case with pedestals) has (2) 12G RAID controllers, (3) 12G RAID expanders, (68) active and (10) spare drives, (11) active PCIe slots, (17) active boards using (20) case peripheral slots, powered via a 1500W and 1200W power supplies along with internal, integrated 1500VA UPS. The unit weighs about 250 pounds with custom caster base, stands about 49″Hx22″Wx29″D. With the Asrock board and it’s user selectable free PCIe (16×4+8×3=88 PCIe-3 lanes) you can do whatever you want with the use of PCIe-riser cable’s and bifurication of the PCIe Lanes. 22×4 – 16×4+8×3, 2×32+1×24 or whatever you can think of. The Asrock EPYC board like the Intel based ASUS X99-E-10G WS (I reviewed on Amazon), will not provide the 88 PCIe lanes you are making claim too simultaneously. The Asrock user does not have available as is the situation with like boards, the option to use both the 16 electrical lane PCIe x16 slot and the adjacent 8 electrical lane, PCIe x 8 slot being that the adjacent 8 lane PCIe slot is a bifurcated then switched 8 lanes derived from the associated 16 electrical lane, PCIe x16 slot. Hence the user has available a single, x16 electrical lane PCIe x16 slot, or (1) x8 electrical lane PCIe x16 slot and (1) x8 PCIe x8 slot, not both the 16 electrical and 8 electrical slots at the same time, it being an either or situation. 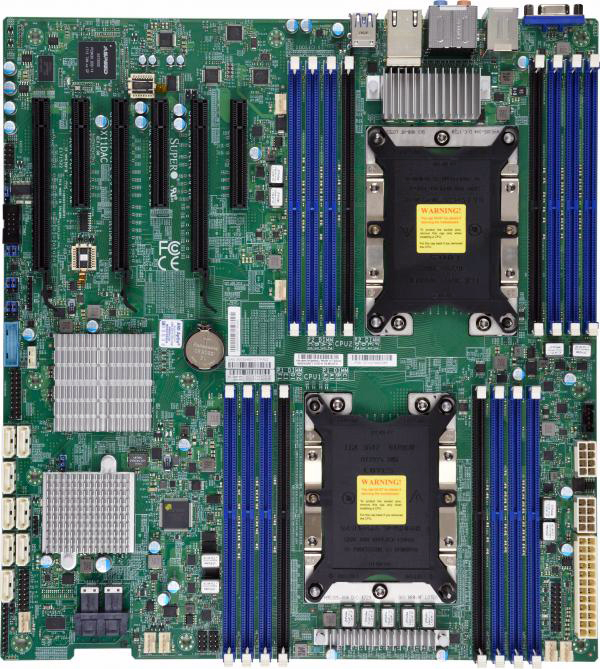 The Supermicro X11DPX-T board functions in much the same manner as the nicely fitted, dual Xeon, Intel W2600CR2 motherboard.